Purpose-made, containerised substations are an important start for industries wishing to achieve significant cost savings. 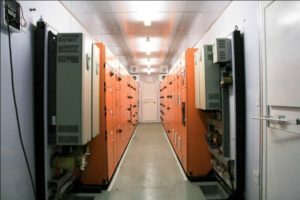 Repurposed marine shipping containers arrive on-site pre-installed with fully tested switchgear, ready for cable connection. Civil construction costs are high and converting a standard marine specification container into a substation is significantly less expensive than arranging for on-site construction of switchgear housing. They are fully equipped and assembled at the manufacturer’s premises and can comprise bespoke combinations of distribution equipment, controlgear and PLC equipment. The units can even be pre-commissioned.Once on site, the containers are mounted on plinths, columns or skids. If mounted on columns, cable entry is possible through openings in the floor at the base of the container. If this isn’t possible, then exterior cable entry boxes provide cable entry through the side.